What makes a film everlasting? are recommendation for the greatest film ever made in drama category is a prime example. Life is full of spice when there is drama involved. This world would have been such a boring place if Lucifer had not rebelled. Drama fills up the blanks in life where the balance of good and evil aligns to make this universe interesting. So is the case with a good play or a film. All the ingredients that go into making a film be pronounced as the greatest are all there and painted on to the celluloid canvas by the master painter, Cecil B. DeMille when he made The Ten Commandments. The Ten Commandments was made in 1956, carved out of not so well known passages on the life and times of Moses. 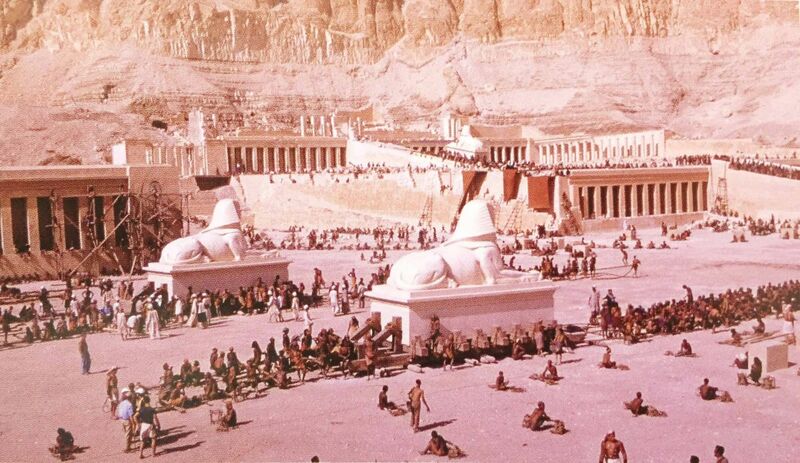 There are scenes in the film that remain with you till eternity like the opening shot of the innumerable Jewish slaves working on the busts, columns and pillars during Pharaoh Sethi’s regime with a dark red painted through the big Cinevista 65 lens making you gasp at such an early stage of a film. The editing is superb. Each scene fills its part. The narrative is about Moses’ life from the time he gets discovered by Bithiah, the daughter of Pharaoh Ramasses I and sister of Sethi I, in the bulrushes when he was an infant up to the time that shows his hard and long struggle as the promised one to free the Hebrew slaves from the hands of their evil Egyptian masters. Moses is raised as an adopted son of the royal family and grows up to become a skilled engineer who designs pyramids and dispenses on-site construction advice. As he is growing up, he discovers about his true Hebrew heritage and decides to take the difficult path of following the truth and attempts to make life easier for those who suffer in the dictatorial regime. Moses gets banished by his half-brother Ramasses II into the wilderness where he survives after forty days of anguish and penance. Gaining sustenance from palm trees and dates, he gets inspiration from a burning bush on Mount Sinai and receives his mission from the Almighty Creator, Jahweh. His mission is to return back to Egypt and deliver the Hebrew slaves out of the hands of the Egyptians as a decree from God. The film covers the deadly plagues, the hailstorm from the skies, the turning of River Nile into blood and the Hand of Death slaying the first born in the Egyptian families; these miracles played a great part in convincing the Egyptians to allow the slaves to go away. 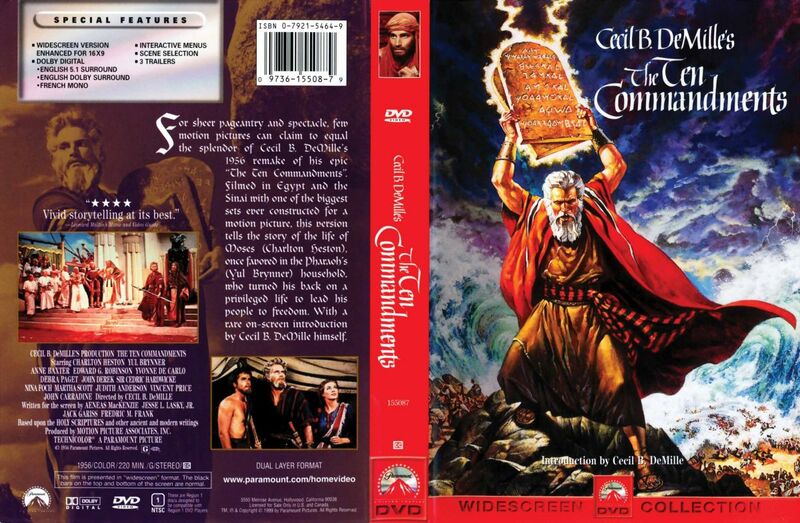 The biggest miracle covered by the film is the parting of the Red Sea and the deliverance of the Ten Commandments. Cecil B. DeMille unfolds the narrative with vitality and extreme clarity. The viewers will not get bored for a single minute in this 219-minute film. When Moses is driven out and spends forty days in the wilderness of Sinai, the photography is awesome. The red and orange flames of the burning bush on Mount Sinai when Moses first encounters his Creator are superb. The burning bush is craftsmanship at its best without the echno supports of the modern age. The scenes of the plagues in Egypt with the Nile turning red and culminating with the descent of the hand of death on the Passover day from the dark blue night sky and clouds are without a parallel even after sixty two years. What do you say then about the parting of the Red Sea? This has to be the greatest scene filmed ever, and without computer graphics! Finally, the scenes of the Ten Commandments being written on stone with fire and lightning from the sky (“written with the fingers of God Himself!”) on Mount Sinai together with the abrupt arrival of Moses during the lascivious revelry under the mount leave you breathless. Charlton Heston as Moses is absolutely convincing in his portrayal, and you can never say that he is not Moses! Yul Brynner is Rameses II in the flesh. I don’t think anyone else would have carried out that role as he did. Sir Cedric Hardwicke is superb as Sethi and Anne Baxter as Nefretiti is gorgeous. A lovely cameo is played by Vincent Price as Baka the Master Builder. Edward.G., Robinson is excellent as Dathan the overseer. John Derek is effective as Joshua and Debra Paget as the water girl Lilia is admirable. This is an intensely muscular retelling of one of the most dramatic passages from the Old Testament. Much has been talked about the film’s scenes, its director and the cast and crew. But no one realises that the entire film’s drama is bound and woven into one texture by Elmer Bernstein with his superb symphonic score. The regal theme of Moses and deliverance remains fresh in my mind even today. The love theme of Moses and Nefretiti is also brilliantly scored. The Ramases II theme is majestic, while the secondary love theme of Joshua and Lilia is beautiful. Drama doesn’t get bigger than this. The way it unfolds makes us marvel at this miracle in film making. There have been films made before and after this one; thousands of them; yet, this remains the film to beat!